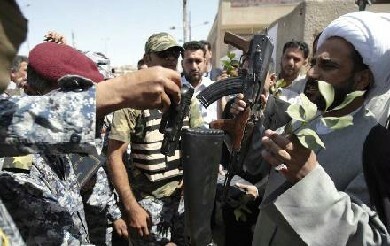 Iraqi Police surrendering to the Mahdi Army in Baghdad. Courtesy AFP via al-Hayat. Ned Parker of the LAT does a good job in clarifying the rivalry between the Islamic Supreme Council of Iraq (with its Badr Corps paramilitary) and the Sadr Movement (with its Mahdi Army paramilitary). The Iraqi government is supporting, and supported by, Badr. An ISCI cleric, Jalal al-Din Saghir, openly admits that the conflict is over control of the provinces. Someone leaked the information that US special forces are fighting alongside the new Iraqi Army to quell the Mahdi Army. The British forces also began fighting alongside Iraq military. The Iranian foreign ministry called Saturday for an end to the fighting, saying that it strengthens the US hand in Iraq and may have the consequence of prolonging the US presence. Iran tends to back the Da’wa Party of Iraqi PM Nuri al-Maliki, and the Islamic Supreme Council of Iraq of Abdul Aziz al-Hakim, so it is significant that Tehran is criticizing this push by those two to destroy the Sadr Movement. I take them at their word. They are genuinely afraid that al-Maliki’s poorly conceived campaign will backfire and that Bush will use it to insist on keeping troops in Iraq. Meanwhile, Turkey claimed that it shelled northern Iraq late last week, killing 15 members of the Kurdish Workers Party (PKK) guerrilla group. The Iraqi Kurds denied the report. – Ten mortar shells hit the Green Zoon today. – Two mortar shells hit Arasat neighborhood, no casualties were reported. – A roadside bomb targeted an Iraqi army vehicle in Al Amil neighborhood, killing one soldier and injuring three others. – A mortar shell hit a house in Al Mansour neighborhood, injuring two members of one family. -Police found two dead bodies throughout Baghdad, one in Sadr city and one in Baladiyat. – An air strike targeted a vehicle used by gunmen in Al Hayaniyah neighborhood, killing 6 gunmen and 2 civilians and injuring 7, eyewitnesses said. U.S. military said an AC130 airplane bombed a house and a truck western Basra killing six. – U.S. jet bombed targets in Al Maqal area, north of Basra, killing three gunmen and injuring two, according to eye witnesses. Late Saturday U.S. airplanes bombed a mosque in Al Maqal area and targets in other areas of the city injuring seven militia members, eye witnesses said. U.S. military said that an air strike killed 11 and injured 22 near Basra today. – Basra morgue received today 39 dead bodies of citizens were killed in clashes. – Mortar shells slammed into Khan Bani Saad town (about 9 miles south of Baquba) killing three members of one family. – A U.S. aerial fire targeted a truck (Kia) in Al Atheem (31 Miles north of Baquba) killing 4 members of one family; the parents and their two children today, Iraqi police said. U.S. military said they have no reports of the incident. – Iraqi security forces found 5 dead bodies in Muqdadiyah.